Seriously is returning to its puzzle roots for the newly soft-launched entry in its Best Fiends series called Best Fiends Rivals. The game was soft-launched on October 25th and is currently only available in Finland on iOS. Additional countries and an Android soft launch are also planned. 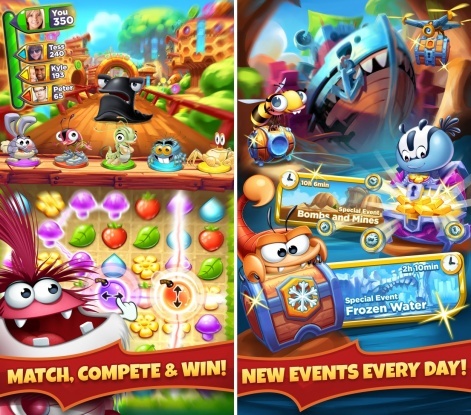 Best Fiends Rivals takes the puzzle element of the original game and adds a competitive edge. Players can team up with and battle other players from around the world to climb the leaderboards and unlock new areas. Seriously will be keeping the game updated with daily events and tournaments to participate in. Rivals will also act as a portal for other Best Fiends content, including its animated shorts. This is the fourth Best Fiends game that has been revealed by Seriously. Best Fiends Slugs, which took the series into 3D for the first time, cropped up in soft launch in November 2016. It has presumably been shelved in favour of Rivals. The developer has been fairly quiet on the game side since then, focusing instead on its original animations. Its first, entitled Boot Camp, launched in May 2017.